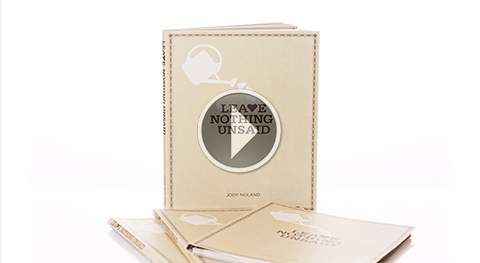 Leave Nothing Unsaid is an easy-to-follow guide for writing a letter that affirms and encourages. A letter that celebrates the qualities that make a person so unique and special. It's a gift that grows even more valuable as time passes and life changes. Simple. Intentional. Lasting. Words that matter forever. Start today and leave nothing unsaid. Have you ever expressed... in writing... your feelings to those dearest to you? Do they know what you think are their greatest strengths... gifts... abilities? Do they know your hopes and prayers and dreams for their lives? If not, why not? Let's face it, life is hard. Words matter. Words are so important. Encouraging written words from loved ones can have a tremendous impact which often outlive the writer. The workbook can be used as a self-guided tool, or as part of a workshop where Jody takes the participants through the process, step by step. Order this step-by-step guide and begin writing words that matter forever. As an author, speaker, and coach, Jody Noland brings an infectious passion for writing words of encouragement. Her greatest joy comes from helping others leave nothing unsaid to the important people in their lives. Whether she's addressing a group of CEO's or sitting by the bed of a hospice patient, Jody brings a simple yet powerful approach to writing words that matter forever. Note: The workshop scheduled for December 8, 2015 has been canceled. We apologize for this inconvenience. We will reschedule the workshop soon. Many of Jody's speaking engagements are to private groups and organizations. As public workshops are scheduled, the dates will be posted here.